Now DSM-5 updated! 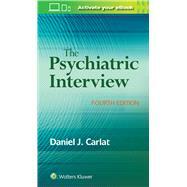 Using a unique and effective combination of mnemonics, practical techniques, and phrasing examples that illustrate the nuances of the interviewing process, The Psychiatric Interview, 4th Edition helps you establish a rapport with patients and gain valuable clinical insights. Now updated to incorporate the DSM-5 and current research, this popular manual teaches you how to improve your interviewing skills, breaking down this complex area into concise information you can put to use immediately in your practice. Offers a practical, concise approach to the psychiatric interview, filled with tips and pearls to develop confidence in interviewing. Uses mnemonics and pocket cards to help you understand and remember key elements of the effective interview. Brings you up to speed with the DSM-5 and current research, including changes in diagnosing dementia, substance abuse, eating disorders, ADHD, and more. Provides clear techniques for approaching threatening topics, and shows how relationships that are endangered can be repaired. Presents information in an engaging, conversational manner, helping you form an alliance with each patient in order to promote cooperation and effective treatment. Ideal for psychiatrists, psychiatric residents, nurse practitioners, or other mental health professionals.